Today life changes as we know it at our house. College Football started on Thursday and that is when the craziness slowly started to appear, but today is when it will take over full force. The Georgia Bulldawgs play their first game today and I can pretty much guarantee that I won't see much of my husband until January. At least he is passionate about something, right? I am looking on the bright side here. Ok, I might be exaggerating a little bit- but I learned the first couple years that we were married that GA football reigns supreme in the fall and I have just accepted it. There is nothing that is more important. But that also gives me lots of opportunities to make tasty food, so it is a good thing. Here is to a great season! It is good to be back in the South! Now, I have this thing for watermelon. I love it. A lot. 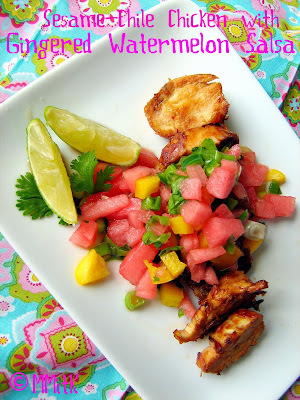 A couple of weeks ago I tried a fantastic tilapia dish with watermelon salsa- that was soo delicious! I saw this recipe- Sesame Chile Chicken with Gingered Watermelon Salsa, on the cover of some sort of Cooking Light special magazine. The salsa ingredients for this one were slightly different, so I wanted to try it and compare the 2 watermelon salsas. This recipe also has great reviews on myrecipes.com, almost everyone who has reviewed it gave it 5 stars. This chicken was really good and so was the salsa, but I liked the tilapia dish better. The watermelon salsas were fairly similar but had a few different ingredients- the one with the tilapia was spicier and I just like fruit salsas with fish better. Don't get me wrong, if I had tried the chicken first and never had the tilapia, I would be raving about it even more. It was good. I am soo excited for a 3 day weekend-football, hiking and time with family. Hope you have a great Labor Day weekend! Great presentation! It looks so summer and delicious! A different combination. Seems to be delicious. What a pretty dish with that gorgeous watermelon salsa on top of the chicken - yum! sooooo happy Dave does not get into football. You are so wonderful to take the plunge and get into it! I want watermelon icecream with a hint of fresh mint...make it- and I can make it vicariously through you! Sorry about your game yesterday...I don't know the details but I heard it was an L and not a W. Bummer. This looks so fresh and delicious! I've got to start making more fruit salsas, they always look so good! I would have never thought to pair watermelon with something savory but this sounds delish. What a unique combination! I love watermelon too so I'll have to try this dish or the one you posted below. Mmm...I've made many a mango salsa, but never watermelon. Must try this soon, looks delish! Great colors! The ginger watermelon salsa sounds delicious!